inContact is one of the most experienced cloud based call center software companies in the world. It is a publicly traded company (NASDAQ: SAAS), is used by over 155,000 call center agents and proudly boasts an industry leading Service Level Agreement (SLA) of 99.99%. In the hosted communication field, inContact stands out as one of the most decorated providers for call center solutions, and has been recognized by reputable analysts over the years from the likes of Frost & Sullivan, Gartner and Ovum. Over 100 of the Fortune 500 companies use their software and it is widely adopted in over 100 countries across the world. The core of inContact revolves around hosted call center products and solutions, collectively called the Customer Interaction Platform. Like other revered platforms in the marketplace, a customer can utilize the services for fielding inbound calls, making outbound calls or a mixture of both. Agents from anywhere can connect to the service making it ideal for multiple office locations as well as accommodating work from home scenarios. The call center products integrate with CRM (Customer Relationship Management) solutions, including out-of-box setups for popular systems such as Salesforce and Microsoft Dynamics. If utilizing a custom solution for CRM, inContact can also accommodate these unique situations. These products work hand-in-hand with automated functions of the software by both routing calls to the appropriate agent as well as recording certain call details to the CRM. A multi-channel system known as MAX works as a comprehensive tool for utilizing all forms of communication including inbound/outbound voice, voicemail, email, SMS, chat and social media. The system design integrates with a variety of other applications like third-party databases or a preliminary IVR to collect data and better prepare the agent for assisting the customer. Agents can also use the system for collaboration by messaging each other and transferring calls when a more qualified individual is required. The Personal Connection Outbound Solution works with agents making outbound calls by furnishing highly visible tools to aid during the process. A predictive dialer helps agents with a patented algorithm, assisting with effective usage of call lists as well as effectively eliminating the time between the customer answering a call and hearing the agent's greeting. 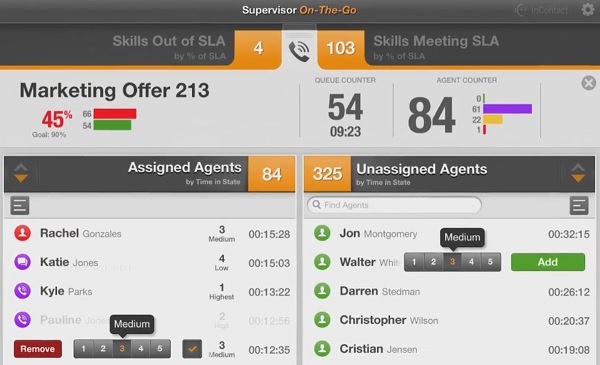 Supervisor-On-The-Go is a unique mobile product for management to both observe the system and take action from a device when on the go. The application features an SLA conscious tool that adapts to the real time performance of monitored agents (see image below). A manager may use this tool to change skill metrics for a particular agent as well as shift calls on the fly. A "Whisper Coach" tool allows intervention on the call to assist an agent without the other party hearing a word or pause. Aside from boasting a complete call center solution with every modern VoIP feature, inContact also promises full regulatory compliance with various industry certifications. Those bound by PCI, SOX, HIPAA, CPNI and FCC will find peace of mind knowing security features to accommodate these needs have been effectively implemented in the software and are controlled on every end of the network. In addition to call center services, complete network connectivity services are available. The company manages a carrier-grade infrastructure, allowing end-to-end network management. It is possible for inContact to provide service for software, data and phone service meaning everything is consolidated from one service provider under a single bill. Workforce Optimization Software is another tool working hand-in-hand with the call center platform and analytics engines. This takes account of KPIs aggregated from various sources, producing feedback for both real time and historic interactions. Custom views may be provided for agents such that they can see their performance metrics and adjust accordingly. In terms of support, inContact has a huge database of datasheets, videos, guides and more. There is also a university area where you can do a deeper dive into its products. It provides live chat, email and direct phone access as well as a full ticket system so you can get all of the support you need. As inContact is one of the most premiere providers for hosted call center services, their record of accomplishment is practically immaculate. Having originally formed as a telecom provider in the mid-to-late 90's, the business has appeared to have kept complaints to a minimum over the years. Like many providers offering call center solutions, a concrete price is unavailable on the website. With the service portfolio being so expansive and service designed to be as "hands-free" as possible, the company custom tailors a solution unique to every client. Certainly, a consultation and inevitable follow-ups will consume time however, this is likely better than overpaying for under-utilized services. This is more of a general comment on call center software rather than negativity towards inContact, but incredibly powerful analytics sometimes proves to be a double edge sword. Though it is great to access incredibly detailed information about any given associate, it is important to remember that holding employees to a standard is necessary but "over managing" may create contempt. Make sure to use analytics to empower and inspire, not to condemn for minor issues. Robust contact solution for outbound and inbound calling centers. Unified software for multi-channel support, known as MAX, aggregates tools for communication via voice, email, chat, SMS and social media. Powerful mobile client for management that allows real-time monitoring, intervention functions like queue manipulation and a "Whisper Coach" for communicating with agents without intruding on a call. Complete networking solutions – inContact acts as a complete carrier for data and voice needs. Adaptive reporting tools for real time and historic analytics of agent performance. The company holds several regulatory compliance certifications for meeting industry standard security protocols including SOX, HIPAA, PCI, FCC and CPNI. Truly, inContact is an impressive company with a history of success in telecommunication endeavors, dating back to 1996. With a full portfolio of contact center solutions, any business requiring large-scale calling solutions are certain to find an amalgamation of products that work. Like many hosted service providers, it will be necessary for a sales consultant to uncover the exact needs for an installation, since no two businesses are quite the same. Even though the lack of a clearly visible price in the web content may irk some, this allows a business to adopt the most viable products without paying too much for a mostly unused feature. inContact reviews are listed in chronological order. The pro of this service is its ability to manage the calls both in and outbound. The con is pretty big. The sound constantly goes out on the agents, and the system needs to be babied by doing extra steps like cleaning up cache on a frequent basis. Cleaning up cache is just an inconvenience, having the sound go out on an agent, especially with any sort of regularity is a failure. The key to inContact and one of the main reasons for choosing them was their powerful analytics package. We spend a lot of time analyzing our customer service department as it is key to our business and the real-time stats means we can stay on top of customer interactions and take action when problems arise.